The official sounds of Valeros the Pathfinder RPG Iconic Fighter. Syrinscape is no longer just for Game Masters. Now YOU can punctuate your roleplaying with the gruff laughs and growls of this brave warrior. Hear the slice of his weapons and the rustle of his armor and equipment. Load up this SoundSet on your personal device and prepare to amaze! 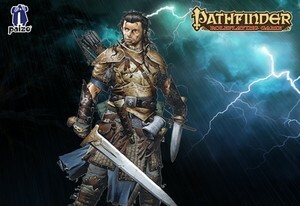 Valeros – Male Fighter SoundSet © 2015 Paizo Inc. Paizo Inc., the Paizo golem logo, Pathfinder, and Pathfinder Adventure Path are trademarks of Paizo Inc. Sounds created under license with Paizo Inc.